The Hutchinson grain pump can take the place of a number of components of traditional grain handling systems. The grain loop can serve as a replacement for any number of grain conveying mechanisms, such as drag chain and en masse conveyors, grain augers, grain legs, and bucket elevators. The layout of the system depends upon the function required of the Hutchinson Grain Pump. Part of Skyways needs assessment process deals with the most appropriate layout for the clients’ particular design and requirements. Listed below are a few, but by no means all, examples of how the design may look. To fill, 2 rows of bins, a horizontal bin fill formation may suit the farm situation better. The high capacity, low maintenance and ease of operation combine to provide the most efficient top-loading grain handling system in the industry. The same may be said for a horizontal bin unloading system, if the circumstance is right. Side spout allow the grain loop to incorporate bins that are not in line into the grain system. Other functions such as grain drying, cleaning, rolling and bagging can be incorporated into the system. Hopper bottom bins can also be incorporated into the system. Where the operation deals with a variety of commodities and uses hopper bottom bins extensively, the design can be configured to allow handling multiple crops without fear of contamination. A Slanted pump is most frequently used when an operation is being retrofitted and the storage system is upgraded to take advantage of the grain pumps versatility. 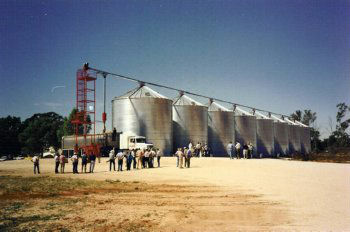 Utilizing existing storage structures, instead of building new grain bins, can save expense. For simply loading and unloading, a “fast auger in fast auger out” configuration may be all that is required. This arrangement can serve to move grain from bin to bin and load and unload into tracks or rail cars. The 6″ pump at 2000 bu. per hour, moves the grain from the surge bin or holding bin, to all the other bins and back. (Connects all the bins); the high capacity augers load and unload. Grain Pumps can also be installed vertically around Flat Bottom bins. The bottom run of the loop is simply installed underneath your aeration floor our in a concrete trough – both with floor inlet wells with slide gates which are open and shut with manual or electrical controls on the exterior of the bin. In situation where bulk storage is used, a grain pump can be constructed to convey crops to and from trucks and rail cars. The use of bin wells and bin sweeps can ensure that all of the crop can be moved turned or blended as required.